Sarasota and Manatee Counties have excellent artificial reef programs that offer boaters, anglers and divers a bounty of recreational opportunities. And while many sportsmen take to the numerous offshore reefs to pursue these activities, a lesser known array of artificial reefs inside Sarasota Bay, in addition to providing these same opportunities, is quietly pursuing another, more ecologically focused goal of providing essential habitat for juvenile gag grouper, an important local fishery. This new focus, led by the Sarasota Bay Estuary Program, is based on the fact that gag grouper (Mycteroperca microlepis), utilize bay habitats such as seagrasses and hard bottoms during the first two years of their life, until they are large enough to move offshore and join the adult fishery. By creating reef material that can satisfy this habitat requirement, our efforts should enhance the survival rate of younger fish, and ultimately enhance the overall adult population. 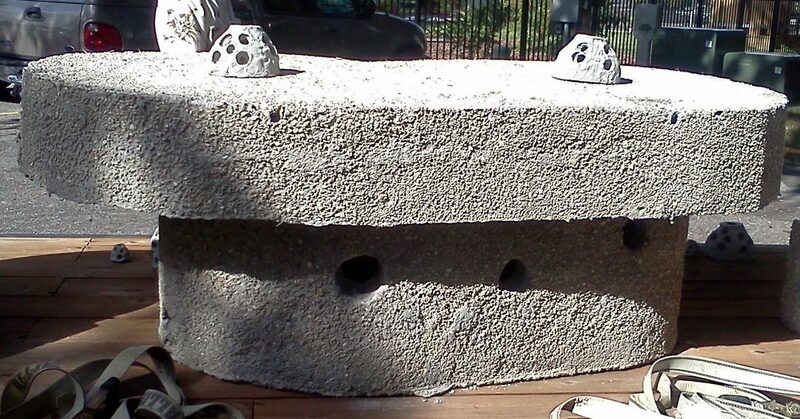 Working with Reef Innovations, a local company that builds artificial reef systems used throughout the world, we have come up with several reef systems designed to attract and accommodate large numbers of small grouper. One design, called the “deep cover” has shown great promise in early monitoring surveys. Paired “deep cover” modules and other materials were deployed at three Sarasota County reefs (Walker, Hart’s Family and Sportfishing Anglers Club) in 2013. Additional paired modules were deployed at three Manatee County reefs (Bayshore North, Bayshore South and Whale Key) in 2016. With a grant from the Florida Fish and Wildlife Commission in 2016, the SBEP has been monitoring the Sarasota County reefs over the past year. These surveys consist of two methods for determining fish abundance and species composition: 1) underwater visual census by divers, and 2) baited remote underwater video stations (BRUVS). 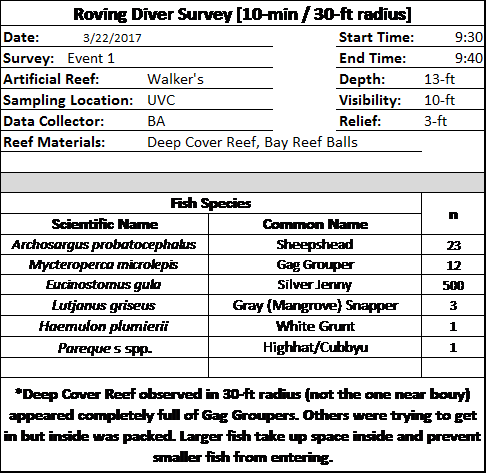 The following table shows the results of the first survey at Walkers Reef from March, 2017. These results were promising indeed! If the remaining surveys show similar results, then the SBEP and its partners are positioned to deploy additional “deep cover” reefs at each location. If fact, SBEP has hired Taylor Engineering to improve the “deep cover” design to ease construction and deployment. The final piece of the puzzle will be demonstrating the link between the juvenile grouper utilizing these reefs and the offshore fishery. To address this important link, the SBEP is in early discussions with local fishery scientists to develop an acoustic tagging program that would allow us to tag fish on our reefs with the anticipation they will be picked up, or “pinged” by receivers currently in place in nearshore Gulf waters. Stay tuned!